We are a bridal boutique selling a new sample. The dress is in perfect condition. 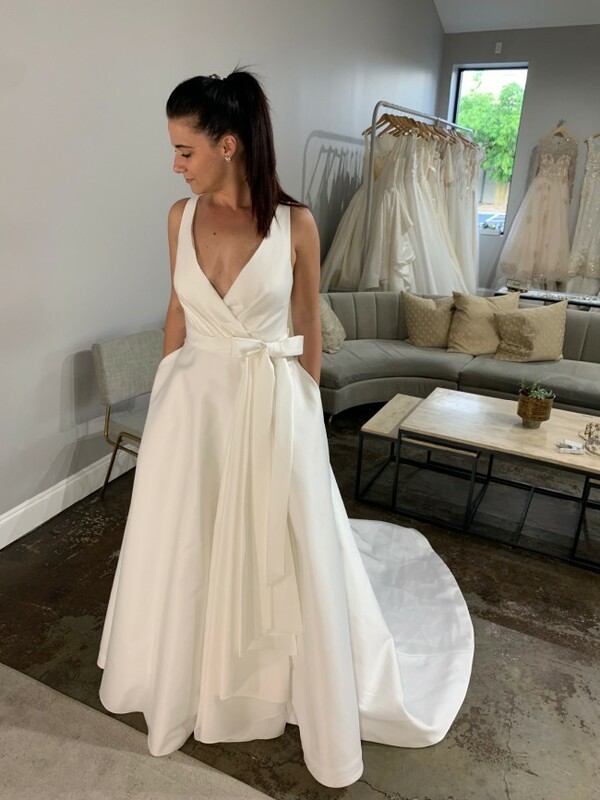 Due to the fact that it has been tried on we will dry clean the gown prior to shipping it. The designer is the well respected Carolina Herrera. Known for her beautiful fits and silk mikado fabrics. The dress fits like a US 10, but is labeled a Carolina Herrera 14(this designer runs small). We are happy to find a seamstress for you in your area. The dress can be altered down to a size US 6 with a bridal seamstress. Also, the dress can be modified during alterations to remove the bow. The dress has a moderate train. There is no damage, stains, or any imperfections. The gown looks brand new. Please feel free to message us with any questions. We are happy to help.